Rates are not valid during fairs, holidays, events, Easter. Arrival in Rome airport, private transfer by car with driver to the hotel located in the city centre. In the evening group excursion “Rome by Night”. Overnight. Breakfast at the Hotel. The morning is free to explore the city on your own. In the afternoon group excursion “Imperial Rome” - an itinerary by coach and on foot to visit some of Rome most famous sights: Piazza Venezia, Piazza Barberini, Piazza del Campidoglio designed by Michelangelo, Circus Maximus, the Aventino Hill, the Colosseum (visit inside, entrance fee included). Time at leisure. Overnight. Breakfast at the hotel. Transfer by train to Florence - one of the most beautiful cities in Italy and cradle of Italian Renaissance. Accommodation at the hotel. In the аfternoon walking tour in Florence (2 hours). Time at your disposal. Overnight. Breakfast at the hotel. In the early afternoon excursion to Pisa (departure at 1:30 pm) - a wonderful excursion to the historic city of Pisa, famous for its architectural beauty. 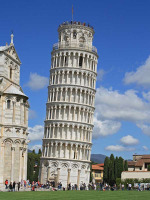 Outdoor guided walking tour of Piazza dei Miracoli and its monuments (exterior). Time at your disposal. If you wish you can experience the thrill of climbing the Leaning tower, one of the wonders of the world (ticket admission not included, to pay on the spot). Back to Florence. Evening at leisure. Overnight. Breakfast at the hotel. 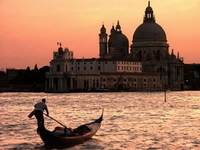 In the morning transfer by train to Venice, city of canals, palaces and art museums. Check-in at the hotel. In the afternoon take a Gondola Serenade - a romantic trip by gondola with music and songs which will take you along the canals of Venice. Evening is free to explore the city on your own. Overnight. Breakfast at the Hotel. In the afternoon excursion by motor boat to the Venetian lagoon islands, with stops at Murano, Burano and Torcello islands. Return to St Mark's Square. Free time. Overnight. Breakfast at the hotel. Private transfer by motorboat to Venice airport. End of the services.